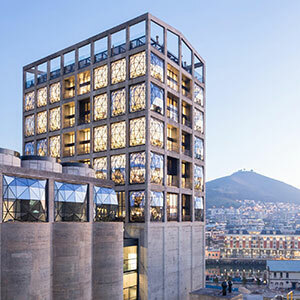 A disused grain silo in Cape Town has been adapted to accommodate Africa’s first international museum dedicated to contemporary African art. A 33-meter-tall storage annex consisting of 42 vertical concrete tubes and a 58-meter-tall grain elevator tower were connected by carving out a central atrium from the silo’s cellular structure. By focusing on the history of the structure, specifically the many billions of kernels of grain that journeyed through the building over the decades, it was decided that the form of the atrium’s volume should take the shape of a grain of corn, one of the many which had passed through the building throughout its history. Main circulation routes are housed within the atrium via cylindrical lifts that exist inside two bisected concrete tubes. The remaining internal tubes were removed to make space for 80 climate-controlled gallery spaces that were deliberately pared back to create a platform or stage for the art on show. The building also contains 28 luxury hotel rooms.